1کارشناس ارشد، گروه روان‌شناسی، واحد کرمانشاه، دانشگاه آزاد اسلامی، کرمانشاه، ایران. 2استادیار، گروه روان‌شناسی، واحد کرمانشاه، دانشگاه آزاد اسلامی، کرمانشاه، ایران. مقدمه:درمان نگهدارنده با متادون یکی از رایج­ترین روش‌های درمانی اعتیاد است. شواهد متناقضی از اثر متادون بر رفتار و شناخت وجود دارد. هدف پژوهش حاضر تعیین تأثیر درمان نگهدارندۀ متادون بر کاهش رفتارهای پُرخطر و جلوگیری از عود مصرف مواد در مردان معتاد شهر کرمانشاه بود. مواد و روش‌ها:تحقیق از نوع نیمه­تجربی با طرح پژوهش پیش‌آزمون-پس‌آزمون با گروه کنترل بود. جامعۀ آماری شامل کلیۀ مردان مبتلا به اعتیاد از بین مراجعه­کنندگان به مرکز ترک اعتیاد زاگرس شهر کرمانشاه در سال 1395 بود که بر اساس معیارهای ورود به پژوهش و پرسشنامه پیشرفت درمان از تعداد 2476 نفر بیمارانی که دارای بالاترین نمرات بودند، 100 بیمار با روش نمونه­گیری در دسترس انتخاب و به­ صورت تصادفی به گروه­های آزمایش و کنترل (50=n) تقسیم شدند. گروه آزمایش متادون درمانی را دریافت نمود اما گروه کنترل مداخله‌ای دریافت نکرد. اطلاعات با استفاده از روش‌های آمار توصیفی، تحلیل کوواریانس و آزمون مجذور کای تحلیل شدند. معنی­داری وجود دارد (05/0>p)، به­این معنی که درمان نگهدارندۀ متادون تأثیر معنی­داری بر کاهش رفتارهای پُرخطر و جلوگیری از عود مصرف مواد در مرحلۀ پس‌آزمون گروه آزمایش داشته است. نتیجه‌گیری: درمان نگهدارندۀ متادون به عنوان یکی از روش‌های مناسب برای ترک مواد و ماندگاری و کاهش رفتارهای پُرخطر می‌تواند مورد استفاده قرار گیرد. 1MSc, Dept of Psychology, Kermanshah Branch, Islamic Azad University, Kermanshah, Iran. 2Assistant Prof, Dept of Psychology, Kermanshah Branch, Islamic Azad University, Kermanshah, Iran. Introduction: Methadone maintenance treatment is one of the most common therapeutic methods for substance addiction. There is conflicting evidence to be resolved about the effect of methadone on behavior and cognition. The aim of this study was to evaluate the effect of methadone maintenance therapy in reducing high-risk behaviors and prevention of recurrent addiction in addicted men in Kermanshah City. Materials and Methods: This study was based on pre-test and post-test design with control group with a quasi-experimental approach. Among all 2472 addicted men with the highest scores of the MAP Care Solutions Program referred to the Zagros Center of Drug Rehabilitation in Kermanshah, 100 cases were selected using convenience sampling. They were then randomlysubdivided into two subgroups of 50, experimental and control. C and with the highest scores of the experimental group was received methadone treatment. The data was analyzed using descriptive statistics and multivariate analysis of covariance and chi-square test by SPSS-21 software. Results: The results showed that the difference between the scores of high-risk behaviors in the experimental group was significant compared with control group pConclusion: Based on the findings of this study, MMT may be an effective method for a successful quitting drug abuse and also durability of the treatment. Ahmadi J, Naghshvarian M, Afshari R. Opioids use in male population referred for mandatory Urine Opioid Screen before marriage in Shiraz-Iran. IJPBS 2011;5(2):126-30. Navidian A, Kermansaravi F, Tabas EE, Saeedinezhad F. Efficacy of group motivational interviewing in the degree of drug craving in the addicts under the Methadone Maintenance Treatment (MMT) in South East of Iran. APN 2016;30(2):144-9. Raeisei A, Sarani H, Arbabisarjou A, Mojahed A. 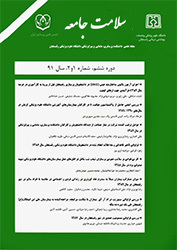 The Most Common Reasons and Incentives of Tendency to Addiction in Prisons and Rehabilitation Centres of Zahedan (Iran). GJHS 2015;7(4):329-34. Salemink E, Van Lier P, Meeus W, Raaijmakers S, Wiers R. Implicit alcohol–relaxation associations in frequently drinking adolescents with high levels of neuroticism. Addictive behaviors 2015;45:8-13. Mokri A, Shams J, Valujerdi AHB, Sahraei H, Yaghoobi M, Ekhtiari H. The Study of the Effectiveness of Olanzapine as a Maintenance Treatment in Opioid Dependents, a Randomized Clinical Trial. Research on Addiction 2009;3(10):53-76. Bava S, Jacobus J, Mahmood O, Yang TT, Tapert SF. Neurocognitive correlates of white matter quality in adolescent substance users. Brain and cognition 2010;72(3):347-54. Bell J, Burrell T, Indig D, Gilmour S. Cycling in and out of treatment; participation in methadone treatment in NSW, 1990–2002. Drug and alcohol dependence 2006;81(1):55-61. Coderre E, Conklin K, van Heuven WJ. Electrophysiological measures of conflict detection and resolution in the Stroop task. Brain research 2011;1413:51-9. Degenhardt L, Randall D, Hall W, Law M, Butler T, Burns L. Mortality among clients of a state-wide opioid pharmacotherapy program over 20 years: risk factors and lives saved. Drug and alcohol dependence 2009;105(1):9-15. Lotfi KF, Mojtabai M, Ali MM. Comparison of the Effectiveness of Cognitive-behavior Therapy, Methadone Therapy, and the Combination Method on Reducing Depression in Addicts. KRAP 2014; 14(54):19-26. Karki P, Shrestha R, Huedo-Medina TB, Copenhaver M. The impact of methadone maintenance treatment on HIV risk behaviors among high-risk injection drug users: a systematic review. EBMPH 2016;2:1229. Cepeda JA, Niccolai LM, Lyubimova A, Kershaw T, Levina O, Heimer R. High-risk behaviors after release from incarceration among people who inject drugs in St. Petersburg, Russia. Drug and alcohol dependence 2015;147:196-202. Marsden J, Gossop M, Stewart D, Best D, Farrell M, Lehmann P, et al. The Maudsley Addiction Profile (MAP): a brief instrument for assessing treatment outcome. Addiction 1998;93(12):1857-67. Zhao M, Fan C, Du J, Jiang H, Chen H, Sun H. Cue-induced craving and physiological reactions in recently and long-abstinent heroin-dependent patients. Addictive behaviors 2012;37(4):393-8. White JM, Lopatko OV. Opioid maintenance: a comparative review of pharmacological strategies. Expert opinion on pharmacotherapy 2007;8(1):1-11. Davis P, Liddiard H, McMillan T. Neuropsychological deficits and opiate abuse. Drug and alcohol dependence 2002;67(1):105-8. Esteban J, Gimeno C, Barril J, Aragonés A, Climent JMa, de la Cruz Pellı́n Ma. Survival study of opioid addicts in relation to its adherence to methadone maintenance treatment. DAD 2003;70(2):193-200. Torrens M, San L, Marinez A, Castillo C, Domingo-Salvang A, Alonso J. Use of Nottingham Health Profile for measuring health statues of patients in methadone maintenance treatment. Addiction 1997; 92(6):707-16. Giacomuzzi S, Riemer Y, Ertl M, Kemmler G, Rössler H, Hinterhuber H, et al. Buprenorphine versus methadone maintenance treatment in an ambulant setting: a health‐related quality of life assessment. Addiction 2003;98(5):693-702. Lin C, Wu Z, Detels R. Family support, quality of life and concurrent substance use among methadone maintenance therapy clients in China. Public health 2011;125(5):269-74.